Now one among you has led me to this week’s prompt so before you all grumble IT IS NOT MY FAULT! This week sees Halloween – a celebration I really dislike (see ‘I Don’t Like Halloween’ ) but the fruits of pumpkins and apples together with steamy breath in the cold air does make it a really lovely season. I’ve been thinking about witches and was tempted to give you ‘When will we three meet again’ but thought that might be a bit harsh. So instead, I want you to create a recipe of a dish fit for a witch. I thought that would give those of you who like to write about blood and gore a chance to shine!! 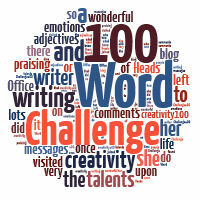 It can be in any format but no more than 100 words. As usual the link will be open for a week and will close on 5th Nov. Help is at hand if you are confused. Have a read of ‘What is 100WCGU?’ Leave me a comment below if you are stuck! Click here to enter your link and view this Linky Tools list. I will move them back to this page as soon as possible! Into my cauldron I will place.. I swear it’s not my fault that..
Hey Julia, what a quick update! I noticed you didn’t copy my title entirely correct. Was wondering if I wrote it like that on linky, but I didn’t. As long as it links correctly (and it does) thnx! Well…I just looked at your “I Hate Halloween” link, and I can understand hating a day like that. Only, it really doesn’t sound like the US version of Halloween I’m familiar with. In my world, it’s a day for children to enjoy dressing up in all sorts of strange costumes and parading around their schools to show off. Some kids – fewer than there used to be, I think – go out collecting candy; the little ones show up escorted by parents, and from seven or eight to early teens they go around in small groups. (Those older than early teens generally don’t trick or treat.) I’ve heard that years ago children who didn’t get candy or other sweets engaged in some minor vandalism – people my age remember “tolotti-ing” or wrapping toilet paper around trees, and twenty years ago kids sprayed shaving cream on cars – but that seems to be out of style. Costume parties for children, or teenagers, or young adults are popular. But I’ve never heard of gangs using Halloween to demand money. Maybe it’s happened – this is a big country, with room for almost anything to happen someplace – but it’s not typical. I dislike Halloween with a loathing deeper than that of a lion staring at a hyena’s cubs. But am in. This calls for rhymed poetry… Wrote this just the other day.